As we cruised the Wachau Valley past small villages, castle ruins and vineyards, I was happy to sit back, relax and enjoy the view. That is until I saw a beautiful blue, Baroque tower come into view. Right away I recognized Dürnstein, the town I had wanted to see most during our visit to the Wachau Valley. As we approached Dürnstein’s colourful riverside buildings, my relaxation turned to eager anticipation. I couldn’t wait to get off the boat and explore this charming town, but I was especially excited to hike up to its ruined medieval castle. Dürnstein is a small town of just over 900 people, best known for its grape growing, historic character and castle that imprisoned English King Richard the Lionheart. Dürnstein has a long history, stretching back to at least 1019, but it wasn’t actually recorded as a town until 1347. It was once the seat of the medieval Kuenring dynasty but later was acquired by the Habsburgs in 1356, after the Kuenring family died off. The town’s location was ideal during the Middle Ages. The rocky, steep riverbanks protected against floods and allowed for fortification. Today, Dürnstein is regarded as the most romantic place in the Wachau Valley, making it a popular destination for tourists visiting the area. Our first impression of Dürnstein was that it was such a cute little town. We could feel the town’s rich history as we wandered the streets, imagining people from medieval times milling about the same picturesque streets. The main street was colourful and had some tourist shops, but thankfully it wasn’t overrun by people (at least when we were there in the late afternoon). After walking the streets for a bit, we started the somewhat challenging hike up to the castle. The trail was really steep in some areas and was a mixture of man-made rocky steps and natural “stairs” of rocks. As we figured out later, this was sort of the “back-way” up to the castle. The heart-pumping hike was worth it though because the views of Dürnstein, the Danube and the Wachau Valley were captivating- some of the best views I’ve seen! We walked all the way up to the top of the castle where the views just got better and better. We explored the ruins and took some time just to stand and enjoy the sights. We really didn’t want to leave Dürnstein! Finally deciding to make our way back into town, we chose to take a different trail than the way we came up. This new trail turned out to be the main route to the castle. It was more of a slope, rather than steep climb, and had no perilous rock steps. There were also signs explaining the story of King Richard the Lionheart and his imprisonment in Dürnstein Castle. The construction of Dürnstein Castle was ordered in the middle of the 12th century by Hadmar I of Kuenring. Its location was strategic in nature, situated high on a rocky hill overlooking the Danube River and the town of Dürnstein below. This stone castle would later gain notoriety as one of the places English King Richard the Lionheart was imprisoned. King Richard’s imprisonment at Dürnstein was the result of a dispute with Leopold V, Duke of Austria, during the Third Crusade. Richard earned his place in Leopold’s bad books when he threw down Leopold’s flag after the Battle of Acre. Leopold also accused Richard of plotting the murder of his cousin, Conrad of Montferrat. This bitter feud led to Richard the Lionheart being captured near Vienna, shortly before Christmas 1192. Duke Leopold ordered the king be brought to Dürnstein Castle, where he was imprisoned until March 1193. King Richard was released from Dürnstein on a technicality- it was unlawful to capture a fellow crusader. As a consequence, Pope Celestine III excommunicated Duke Leopold and custody of King Richard was given to Emperor Henry VI. Soon after, the emperor had King Richard imprisoned at Trifels Castle in Germany, where he was held ransom to raise money for Henry’s army. This move led to Pope Celestine III also excommunicating Henry VI for the continued wrongful imprisonment of Richard. After all this, King Richard the Lionheart was finally released on February 4, 1194. We very much enjoyed our visit to Dürnstein, especially the hike to the ruined castle. The views were spectacular and I was fascinated by Richard the Lionheart’s tumultuous tale. As I read about his story, a movie played in mind of all the drama that must have occurred here. 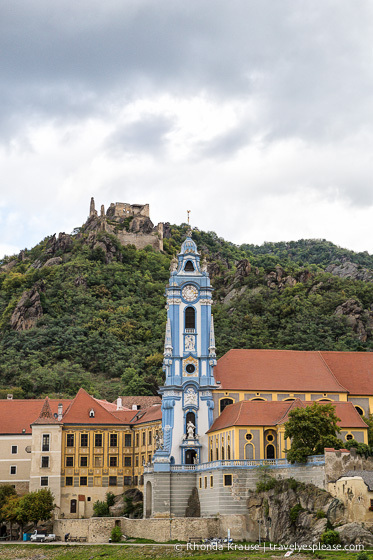 Dürnstein is small, but definitely worth a visit if you are ever in the Wachau region. The irresistible mix of historic sites, traditional architecture and breathtaking natural scenery, made Dürnstein one of our favourite places in Austria! We visited Dürnstein while cruising the Wachau Valley from Melk to Krems. Dürnstein was the last stop before Krems, the final destination. If you decide to disembark here, you’ll have to find your own way into Krems, as the boat does not stop long enough for people to explore. 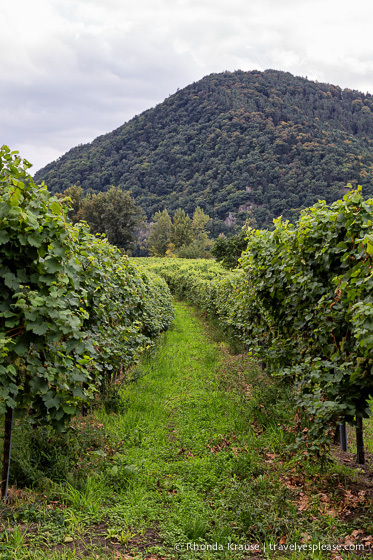 To get from Dürnstein to Krems (where we caught a train back to Vienna), we walked a short ways down a vineyard-lined road to a main intersection where we caught a bus into town. We just asked a shopkeeper for help and they told us where to catch the bus. There are two different trails to get to Dürnstein Castle. One is an easier walk, with historical information posted along the way, but it’s not as scenic. The other option (starting on the far side of town, away from the dock) is more challenging, in terms of terrain, but the views are fabulous! For your convenience, here is a list of hotels in Dürnstein. Please consider booking your accommodations through the included link. It costs nothing extra and helps support this website. Thank you!